VOTE for Nanon by posting a comment below. 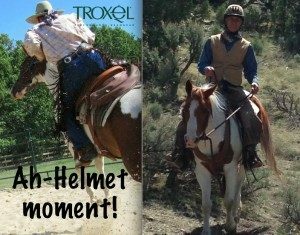 My ah- helmet moment came several months after falling off of my horse and suffering a helmetless concussion. I was talking with my doctor, a triathlete who had suffered a head injury while wearing a helmet when a dog ran in front of her bicycle. Right then I said to her that I would never consider getting on a bicycle without a helmet, so why would I consider getting on a horse without one? I have worn a helmet ever since!